Melt 25g butter in a casserole dish on a low heat, add the onions, stir and cover. Cook for 10 minutes, stirring occasionally, until the onions are soft. Meanwhile, bring a small pan of water to the boil for the eggs. Put the rice, 250ml cold water and a pinch of salt in another pan with a tight-fitting lid. Bring to the boil, cover and turn the heat down to low for 5 minutes. Take off the heat; leave with the lid on for at least 10 minutes. Add the eggs to the boiling water; turn it down to a gentle simmer with infrequent bubbles. Leave for 4 minutes, take off the heat, cover, and leave for 8 minutes. Put the fish in a frying pan, skin-side down; pour on the milk and enough boiling water to cover. Bring to the boil, then heat without boiling for 3–4 minutes until the thickest part is not transparent. Drain; remove the skin and any bones. Drain the eggs and run under cold water. Peel, quarter, then set aside. Add the spices and bay leaves to the onion and turn up the heat. Cook, stirring for 2 minutes, until the onions are golden. Add the rice and stir well. 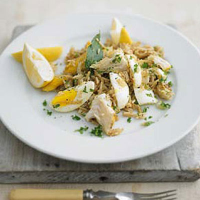 Flake the haddock into chunks and fold into the rice with the eggs. Anoint everything with lemon juice and dot with the remaining butter. Shower with the parsley and serve with the lemon wedges.